New to CrossFit and not sure where to begin? If so, then welcome. This series will address the primary concerns and focal points for a starting CrossFit athlete, orienting your use of resources throughout the entire CrossFit.com universe. In this second part of A CrossFit Startup Guide, Todd Widman builds on Part 1 to focus your entry into CrossFit workouts and fitness in general. Gone are the promises of easy and comfortable results. The best CrossFitters educate themselves both about movement and fitness broadly, as well as about their own individual strengths and weaknesses. 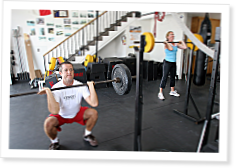 Of course, the best way to begin CrossFit is with a great trainer who uses his or her vast experience to guide you through the various phases of your fitness quest. This series is not intended to equal that. It cannot. Instead, we recognize that not everyone has access to such a trainer, and this will help those folks get the most out of the vast resources available on CrossFit.com. After a review of the broad goals of CrossFit and fitness in general, Todd explains the importance of intensity; both its need and danger. The three movements covered are the front squat, push press, and deadlift, including many references to the great articles and videos already published throughout the site. Finally, there is the first part of how to scale these workouts intelligently for maximum results. This article is less about how to do the movements and more about how to use the website to educate yourself and develop your fitness. The erro msg "link appears broken" keeps coming up any one else getting it when they try to download this article?? It wont download for me either. Sorry folks. I had the file in the wrong folder on the server. It should be working now. Todd, another awesome article brother. Keep up the good work. Great articles Todd. It reminded me of your interview on CFR and I like how these articles were an extension of that interview. Great article, but why is this one members-only when the first article is free? I have some people looking to take up CF who can't get access to this one. I want to start Cross Fit tomorrow. What workout do I follow? Is there an intro workout or is there a warm up? Where do I find part 3?